Ever wonder how the GTX 1080 Ti stacks up against the GTX 1080 from Nvidia in ultrawide resolutions? We’ll be answering that question. Last year I did a showdown with what was then Nvidia’s two flagship graphics cards in the GTX 1080 & 1070 at ultrawide. But now with the GTX 1080 Ti available for $699 and the GTX 1080 getting a nice price drop to $499, I thought this was worth revisiting. We’re testing these games on the brand new Acer XR382CQK which runs at a native 3840×1600 and 75hz, all the while supporting FreeSync in this 38 inch monster of a panel. I also tested at 3440×1440 which is a much more common resolution on high-end UltraWide displays, like the Acer X34 I reviewed some time ago. We are including 3840 x 1600 because this is the first time I’ve been able to play with a 4K ultrawide monitor. After using one I certainly hope we begin to see more of them out there and eventually one with G-Sync support. We aren’t going to waste much time here because I know you guys want to get into the numbers, but first I wanted to give a rundown of the test system I used here which is my Frame Raider build featuring the Intel i7-8700K which is overclocked to 5GHz and running on a liquid all in one cooler. For the RAM, I’ve got 16GB of G.Skill TridentZ DDR4 memory which I keep at 3000MHz in the Gigabyte Z270 Gaming 7 motherboard and all of our games were running off Samsung SSDs. Both of the GPUs here were overclocked with an additional 200MHz on the core and 300MHz on the memory for the GTX 1080 & 1080 Ti which are both Founders Edition cards and lastly all of our games with one exception were tested on the games available ultra preset with no additional anti-aliasing. 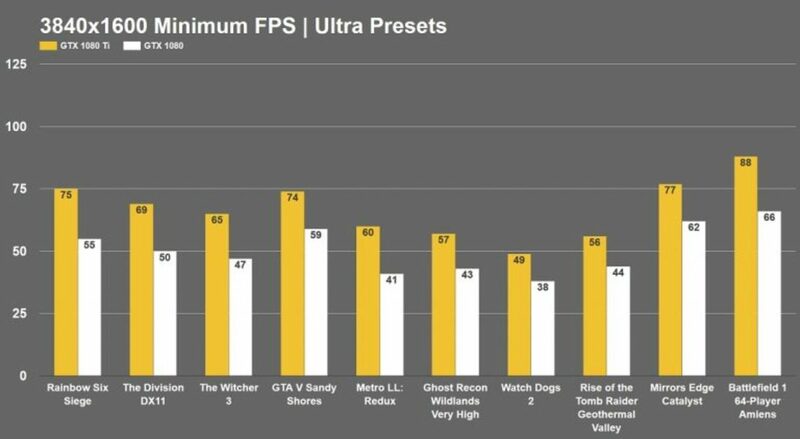 The one exception here was Ghost Recon Wildlands which I tested on Very High because I find the ultra setting in that game to be grossly unoptimized while Very High runs like greased lightning. Enough of that though let’s delve into these benchmarks starting off with 3440 x 1440 averages and then we’ll move into the minimums as well. 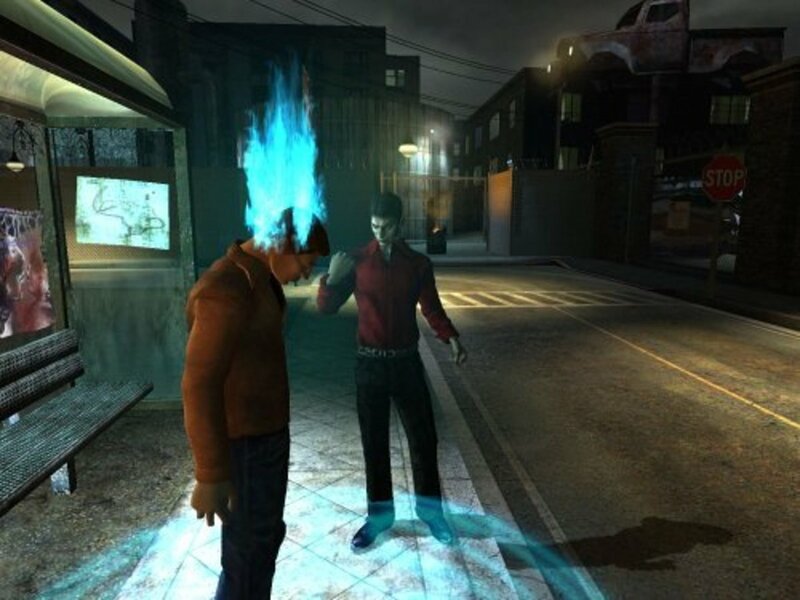 In these modern games that I tested the GTX 1080 showed its strength as an excellent value card for $499, being able to power demanding titles at a resolution of 3440×1440. The only games where it dipped below 60 in the averages were Watch Dogs 2 and The Witcher 3. 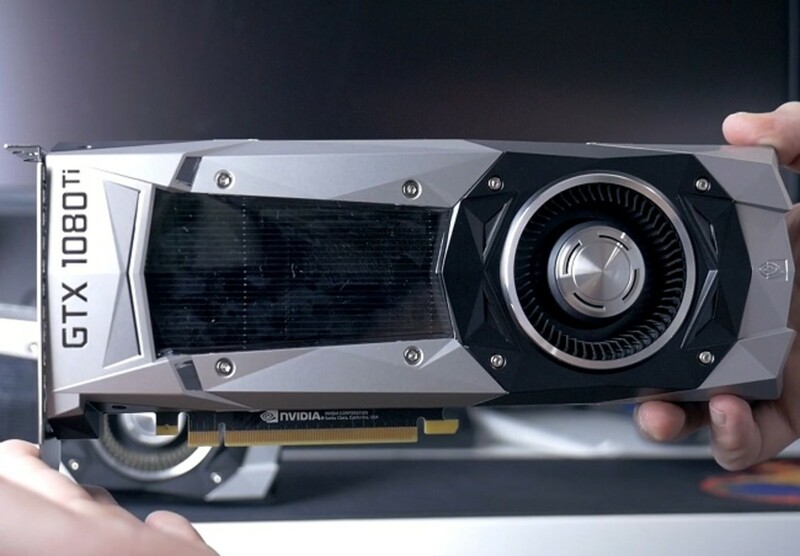 Showing to most people out there the 1080 is a great card for that resolution. 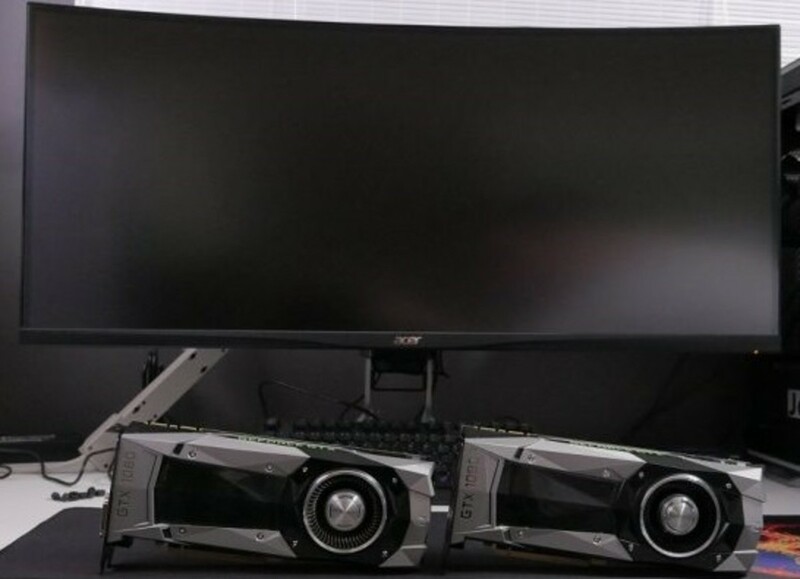 However with displays like the Acer X34, many gamers want to take advantage of the higher 100hz refresh rate and I think that’s where the 1080 Ti shows its value. Getting over 70fps in every game but one here is incredible. I think for people wanting no compromises, meaning not having to lower options ever and getting the most fps possible over 60 frames, then the 1080 Ti looks like the best choice available right now and offers a significantly better value than Titan X which costs nearly double the price. That story continues in the minimums where the 1080 Ti is just dominating the 1440p UltraWide resolution, only going below 60 frames by a few FPS in one game, Watch Dogs 2. 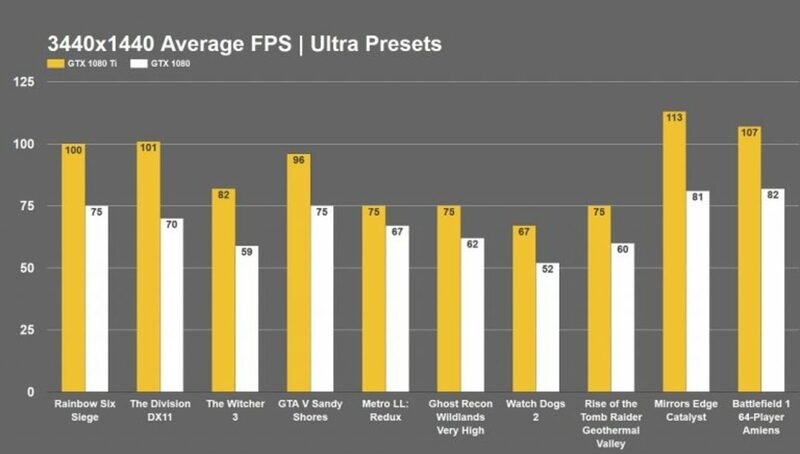 Other games like Rainbow Six Siege we have a minimum of 87fps, 86fps in GTA V Sandy Shores and over 100FPS minimum in Battlefield 1. 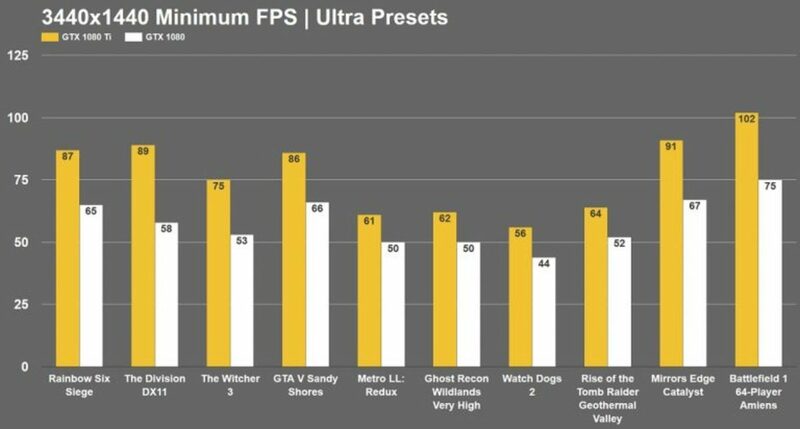 If I’m on the fence about spending the extra $200 on a 1080 Ti for UltraWide 3440×1440, this is the graph that just made my buying decision for me because minimums are everything. As mentioned earlier I also tested at my monitors native resolution of 3840 x 1600 so we are talking about moving a lot of pixels here and once again the 1080 Ti shows why you pay the extra money for it. Only dropping down below 60 average in one game here, Watch Dogs 2 which saw 58fps average in my benchmark run. 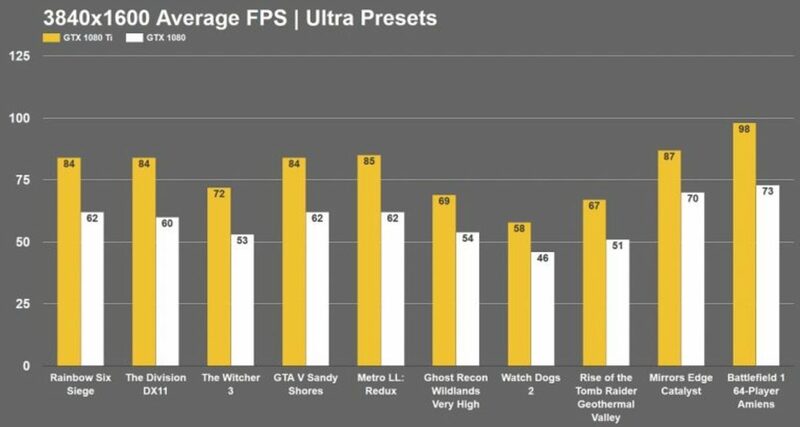 Other games like Siege, Witcher 3 & Ghost Recon Wildlands all run like butter, but when I played these games on my GTX 1080, it was not a pleasant experience, regularly falling below 60fps as you’ll see in the graph now with the minimums. At the end of the day, both the GTX 1080 and 1080 Ti are currently the best you can get for UltraWide without considering the Titan X which was made virtually obsolete by the 1080 Ti. The GTX 1080 at $499 now is an excellent value graphics card when you consider how well it was running these demanding titles shown here at 3440×1440, the more common of the two resolutions tested. And certainly capable still at the higher resolution, but you will be needing to lower down some options which leaves us with the 1080 Ti. As I mentioned before the 1080 Ti is what I would call a no compromises purchase. If you need the most frames possible and never want to lower a graphics slider, then this is the card to get. AMD has nothing right now that is a direct answer to it which is a real shame because the monitor I’m using is a Freesync display that I would love to take advantage of. Hopefully, Vega or the RX 500 series isn’t too far away for us gamers wanting to utilize FreeSync, but need the GPU to power high resolutions. But I’m gonna go ahead and get on outta here guys, please let me know your thoughts as always down in the comments on the tests run here today and tell me which card you will be getting to power your gaming needs. 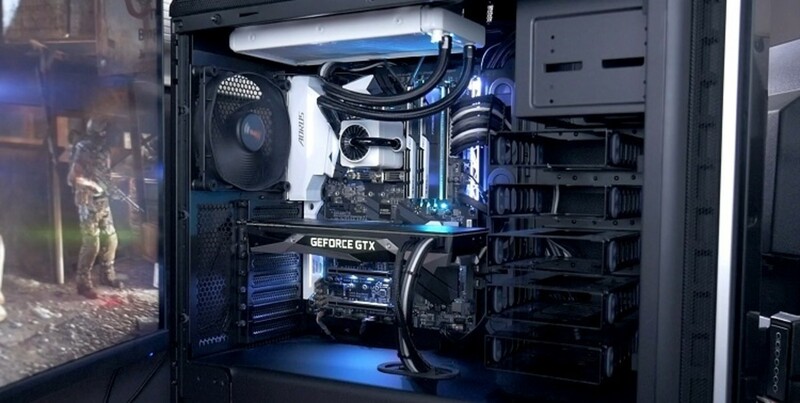 Is it the 1080 or 1080 Ti? I’ll be sure to leave links down in the description for the monitor I used which I’ll be reviewing very soon as well as the Nvidia cards if you’re interested in those and while you’re down there please consider leaving a comment here. Thanks for measuring both cards. I’m currently running 2x 970 GTX in SLI on 3440x1440. But decided to switch from two cards to one. 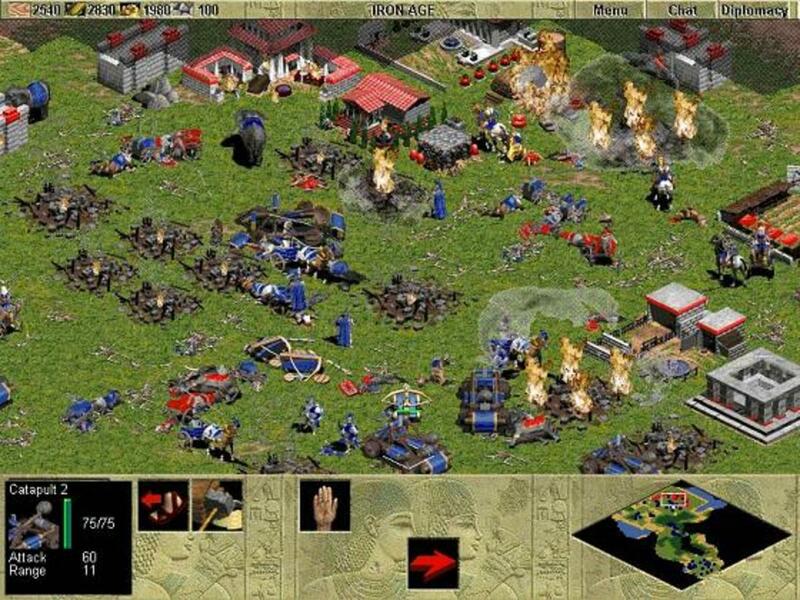 Seeing this, I have a 60hz monitor the 1080GTX will provide what it takes.